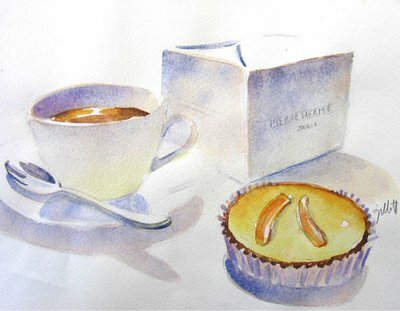 Tarte Citron au Citron, 9" x 11 1/2"
And without further ado the winner of the best tarte au citron in Paris is none other than PIERRE HERME! This was a surprise for me. I thought Gerard Mulot hands down would be the bestest, with his simple, direct, flat lake of a tarte. 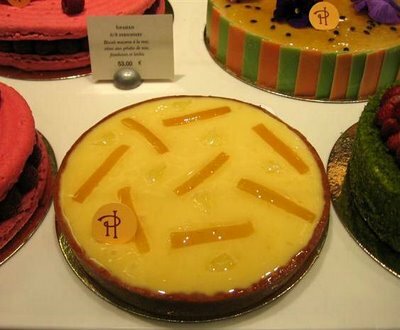 I was convinced you should not desecrate a citron tarte's smooth surface. Boy was I wrong. 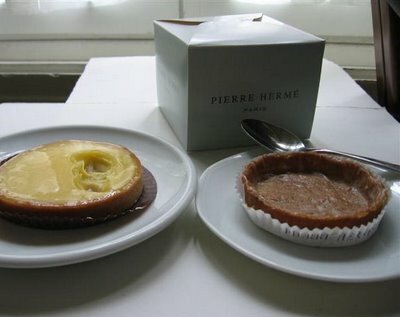 These generous pieces of lemon zest in Pierre Herme's tarte are NOT candied, but pleasantly tart. 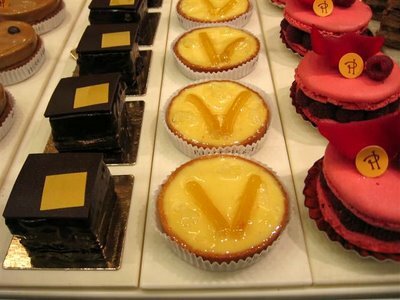 In fact this tarte was the tartest of all the the Parisien tarts. 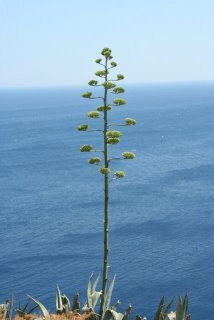 And the most lemony. Pierre Herme titles his tarte, "TARTE CITRON AU CITRON" with good reason. 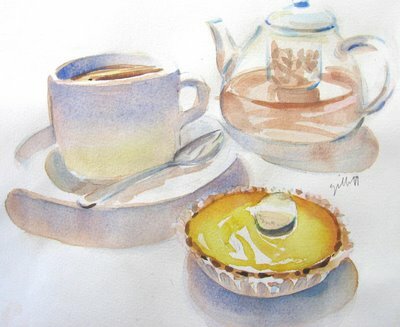 tarte au Citron,watercolor on Etsy, 9" x 11"
Here the results of Gerard Mulot vs. Pierre Herme (on the right)A picture speaks a thousand words. Oh I see Lemon is the new chocolate! I like how you emptied the lemon filling and left the DELICIOUS PIE CRUST!! How could you! Your good!! The square tart is a nice twist! But not a bite to spare..
Hi there, i love your site, it is so pretty. 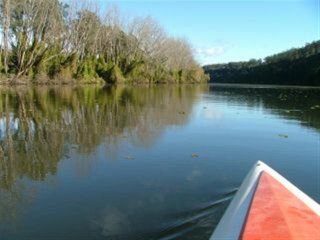 thank you for visiting my blog and leaving a comment. i have been wanting to try Pierre Herme for a while, apparently his macaroons rival laduree's and have you tried his cheese chocolates? I am so glad you stated just which one was the best, but not cloyingly sweet. I tried one once in the south of France and nearly gagged on the sugar. No thanks. Give me the lemon! Now you need to do that wonderful strawberry dessert. And how about the cake Opera? I made it once - dirtied every pot and pan in the kitchen, but my friends beg me for it even now. Love your site! I paint, but just can't do watercolor. I scrub up the paper and make a big mess, so I do appreciate your deft touch and delicate use of color. You always get the meaning clear. Thanks for the daily enjoyment. Breakfast is my favorite meal, always with remembrances of breakfasts in France: baguette, croissants, coffee, yogurt, confiture. Can't understand people who just don't do breakfast. Have you noticed how cranky they are? I envy you this joyous exercise. Wish I could be tagging along with you. I think lemon tarts are simply scumptious. Oh, dear, sounds all so delicious, lemon-luscious. The NYTimes reports about Agata & Valentina's preserved Meyer lemons at 1505 First Avenue (79th Street). There's no tart like a French tart. Oh mon dieu! Absolutely scrumptious looking! Loving your dedication and sacrifice....!! I love anything with lemons and the citrus testing is on my list for the next trip. Beautiful illustration, as always. Well, I see I am going to have to do some taste tests of my own. Tough job but someone has to do it. I've always loved lemon meringue pie so I'm thinking I may lean toward to sweeter tarts but I could be wrong! I'm jealous of your taste. This must have cost you a fortune! I've had too many sweet lemon tarts also. Carol: Thanks for performing this very valuable (and delicious) customer service! 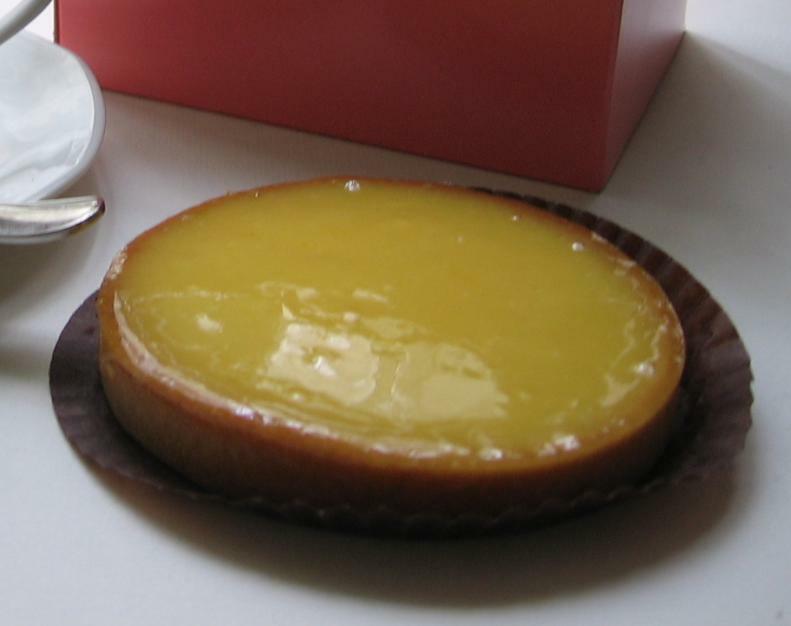 I would love to have a good recipe for tarte au citron. 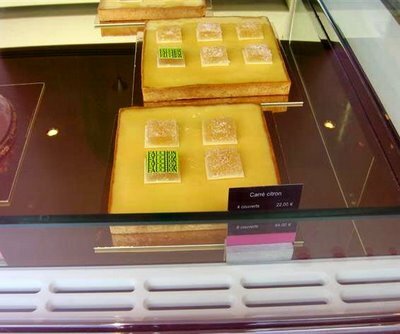 I loved the small tarte au citron at Laduree. I want to make when that is very lemony and creamy, but the recipes I have found are without cream and have a solid lemon filling.